Inkluded champions diversity in publishing by supporting like-minded organizations towards actualizing their missions and goals and, in doing so, encourages inclusivity amongst publishing professionals and readers of all ages. Through our programming, we’ll not only facilitate actionable discourse and honest discussion regarding the lack of diversity in our business, but actively work to develop and place young people from diverse backgrounds into their first publishing jobs. Equally, by way of emboldening marginalized voices and making the literary community a more welcoming and aware space for all writers, readers, and industry professionals, Inkluded will continue to help advance like-minded organizations including We Need Diverse Books, The “I Have a Dream” Foundation, Kweli Journal, NJ LEEP, and Barbershop Books. To donate to inkluded, click here. In 2018, Inkluded focused on our administrative and organizational goals to secure our official status as an incorporated non-profit organization. With this new standing under our belt, we are excited to continue supporting like-minded organizations in the industry, as well as offer new opportunities and events to promote a more diverse publishing community. 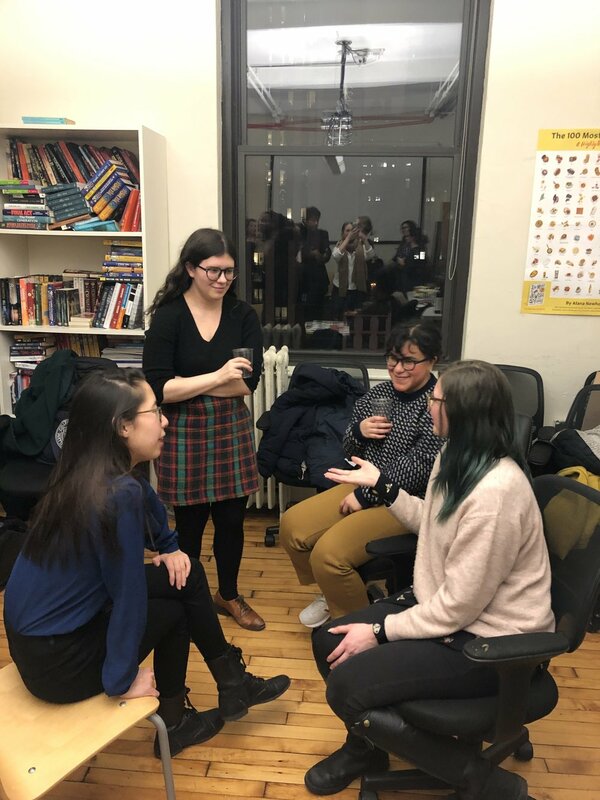 We held an event at Writers House featuring readings by Hafizah Geter, Torrey Maldonado, and Ashley Lauren Rodgers. Additionally, we encouraged attendees to bring book donations. We successfully gathered and donated 1,000 books to New Alternatives for Children, a nonprofit that supports families who are caring for special needs children at home. Inkluded was officially granted our 501 (c) 3 status, recognizing us as a nonprofit organization! As a nonprofit organization, we officially became incorporated in New York City. This status legally extends our programming and fundraising abilities, and allows us to directly assist candidates seeking publishing opportunities. Stay tuned for more about our events for 2019, including Inkluded Academy, a publishing course that is free of charge and seeks to bring aspiring professionals from diverse backgrounds into the industry. For more information on the work we did in 2017, please click here! Please check back soon for more 2019 events! We’re seeking applicants from excluded backgrounds interested in breaking into publishing. Inkluded Academy is a tuition-free publishing course taught by industry professionals to college graduates from excluded groups. Held over the course of 7 Saturdays this summer, the program will include a rigorous curriculum, invested mentoring, and a commitment to job placement. Inkluded Academy will be a much-needed pipeline between the book business and aspiring professionals from diverse backgrounds. For more information on Inkluded academy, click here. THINK you’d be a good fit for inkluded academy? APPLY HERE. 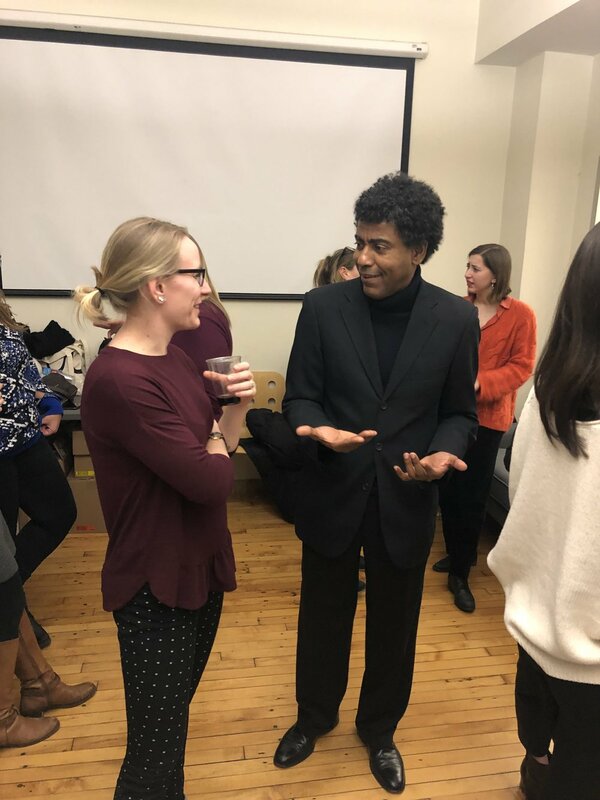 Michael Mejias has been at Writers House for two decades and founded the Writers House Intern Program in the year 2000. Mr. Mejias designs and implements the program’s curriculum and manages its day-to-day operations. Through the program, he has helped place over 300 graduates in their first publishing jobs, with over a third of those students belonging to excluded groups. An advocate for diversity in publishing, Mr. Mejias routinely partners with non-profit organizations including TEAK, NJ LEEP, We Need Diverse Books, and Girls Write Now, for the purpose of creating career opportunities for young people of color in the book business. To that end, he’s a regular guest speaker at local high schools, colleges, publishing houses, and publishing programs. In March of 2016, Mr. Mejias was selected by the Cameroon American Council to develop the curriculum for and lead their "Breaking Into Publishing" workshop. Recently, he developed the curriculum and implementation strategy for Inkluded Academy, a publishing course, launching in the Summer of 2019. Mr. Mejias is also a playwright whose work has received readings, workshop productions, or full productions by the Nuyorican Poets Cafe, the Puerto Rican Traveling Theatre, the INTAR Hispanic American Theatre, the Spanish Repertory Theatre, and the New Federal Theatre. His last play, Ghetto Babylon, received the 2012 National Latino Playwriting Award, and his stand-alone monologue, Mujeriego, was included in the anthology Voices in the First Person: Reflections on the Latino Identity (Simon and Schuster, 2008). Mr. Mejias is also the co-founder of the Dramatic Question Theatre (DQT), a non-profit dedicated to developing and presenting work by women and people of color. Plays developed by DQT have received numerous national honors and have been nominated for the Drama Desk Award, Drama Critics Circle Award, Outer Critics Circle Award, and the Lucile Lortell Award. Mr. Mejias grew up in the West Farms Housing Projects in the South Bronx. Andrea Morrison is a Junior Agent at Writers House, where she started as an intern and fell in love with Publishing. She studied Literature & Writing at University of California, San Diego, and earned her MFA in Fiction from Columbia University. She's actively building her client list, with a focus on a wide range of genres. On the adult side, she’s particularly excited about fiction that blends gorgeous sentence-level writing with stories featuring younger protagonists, and heartbreakingly honest narrative nonfiction. On the children's side, she loves YA that blends crazy-beautiful language with characters navigating the nutty, magical, and hard parts of being a teen, quirky and humorous middle grade, and picture books that beg to be read over and over again. Most importantly, she falls for characters that need to be heard—for stories that grab your heart and don’t let it go, even after they’re finished. You can find her on Twitter: @AndreaAgency. An Atlanta native, Alexandra took a circuitous route to publishing. She graduated from Johns Hopkins University with a degree in neuroscience, and then, realizing her passion lay closer to books, she enrolled in New York University’s Master’s program in Publishing, Print and Digital Media, and will get her degree in May. Currently, she works as an editorial assistant at Penguin Random House in children’s publishing under the Delacorte imprint. Previous to joining Delacorte, she was a Summer 2016 intern at Writers House. Natalie Guerrero is the assistant to Georges Borchardt at Georges Borchardt Literary Agency. She graduated from Boston University with a BFA in Theatre Arts and Communications. Natalie's passion for fostering diversity in the arts and publishing had always existed but was further developed when she interned at Writer's House in 2016. She is excited to continue to be a champion of diversity in publishing with her team at Inkluded! Mackenzie has been an agent with the Stuart Krichevsky Literary Agency since 2016. Prior to that she was an agent with New Leaf Literary + Media and Charlotte Sheedy Literary Agency. Her clients have appeared on the New York Times Bestseller List, and have been winners of the NAACP Image Award and the Black Caucus of The ALA Award and finalists for the Lambda Literary Award and ALA Carnegie Medal. As a former research scientist, she has a great passion for science books, as well as sociology, investigative journalism, food writing, memoir, business, and contemporary YA fiction. She particularly appreciates work that sheds light on marginalized experiences and helps contribute to the cultural conversation. Mary Gaule is an assistant editor at HarperCollins. Her interests include literary and upmarket commercial fiction and she is particularly interested in books that offer unique perspectives on women’s experiences and relationships, as well as projects that shed light on marginalized voices. A California native, Mary attended the University of San Diego where she majored in English. Julia Kardon was born and raised in New York City. Her first job in publishing, while in high school, was shelving fiction at the fabled Strand Bookstore. After receiving degrees in Comparative Literature, as well as in Slavic Languages and Literature at the University of Chicago, she moved to Prague to teach English for a year. Julia then returned to New York to restart her career in publishing. She joined HSG in 2018 after building a list at Mary Evans Inc and handling foreign rights. Her clients include New York Times Best Seller Brit Bennett, Barnes & Noble Discover picks John Freeman Gill, Leah Franqui, and Etaf Rum, Center For Fiction Emerging Writer Fellow Melissa Rivero, Moriel Rothman-Zecher, Marcelo Hernandez Castillo, and others. Mia works in foreign rights at New Leaf Literary & Media, where she happily handles a varied list of fiction and non-fiction. In her previous life, she was a journalist in Sao Paulo, Brazil where she was born and raised. However, her love of books could not be curtailed, so she moved to New York to pursue her Master of Science in Publishing at Pace University, and started her career in Publishing with an internship at Writers House. She is passionate about any project or story that promotes underrepresented voices, and that focuses on different cultural experiences than her own. Coming from a very different culture and an immigrant herself, she would love to see more people join the publishing industry to have as great opportunities as she has had in the past. Vedika Khanna is an assistant editor at HarperCollins and got her start in publishing as an intern at Writers House. She is a committee member of the People of Color in Publishing group and a mentor with the Representation Matters Mentorship Program. She graduated from Middlebury College with a degree in English and Creative Writing and has lived in South Korea, Vietnam, and the United Arab Emirates. Want more information about Inkluded? Have an idea for a collaboration? Want to join our mailing list? Please add me to the Inkluded mailing list. Want to keep up with the latest Inkluded news? Follow us on TWITTER.